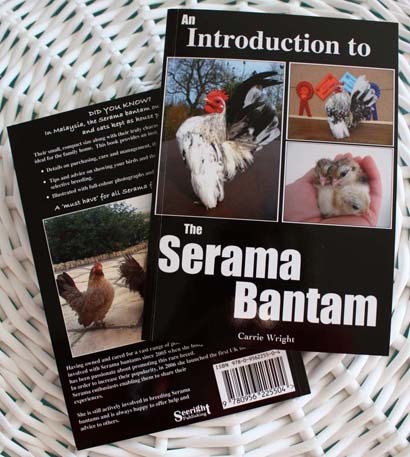 "An Introduction to the Serama Bantam". A 'must have' for all Serama fans - both new and old. If you are already lucky enough to own this amazing breed then you will enjoy this book as it covers topics such as breeding, exhibiting and the recently agreed Standard for the UK Serama bantam. This book is also an essential reference guide for individuals new to the breed seeking to obtain information and guidance in respect of all aspects of Serama ownership, providing up to date advice on choosing your birds, housing, feeding and diagnosing illnesses. In Malaysia, the Serama bantam outnumber dogs and cats kept as house pets. Their small, compact size along with their truly charming personality make them ideal for the family home. This book provides an insight into this fascinating bird. Details on purchasing, care and management, their dietary needs and more. Tips and advice on showing your birds together with valuable information on selective breeding. If you would like to purchase a book, please select your postage rate for your area and click "Buy Now'.